Hi! I'm so glad you are here! 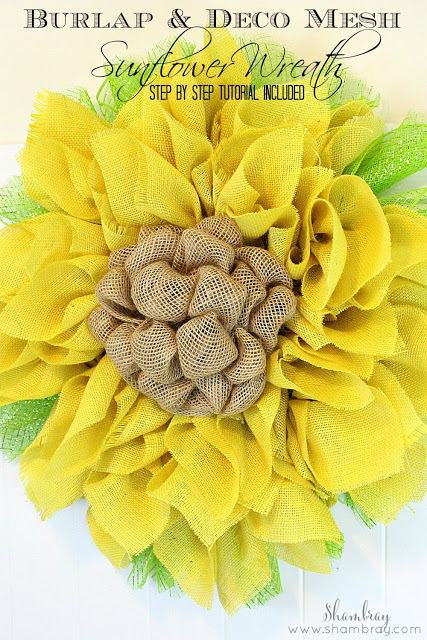 I am sure you are here because you want to make this stunning sunflower wreath. It is a show stopper and wherever you put it in your home it will be a conversation starter and people will love it. This wreath is absolutely stunning and is perfect for the Spring and Summer months! It is durable and can be hung up outside on your front door. It would make a great first impression to anyone who came to your home. It would also make a fantastic wall hanging inside your home. See the detailed tutorial below to make one for yourself. If you don't have time or this project intimidates you, but you still want this stunning wreath then check out my Etsy listing and I will make it for you. If you would like a printable tutorial along with pictures then click HERE! You can see the step by step process below, but if you want to print it so you don't have to look on the computer than this is your solution! 1. Prepare the wire wreath form. 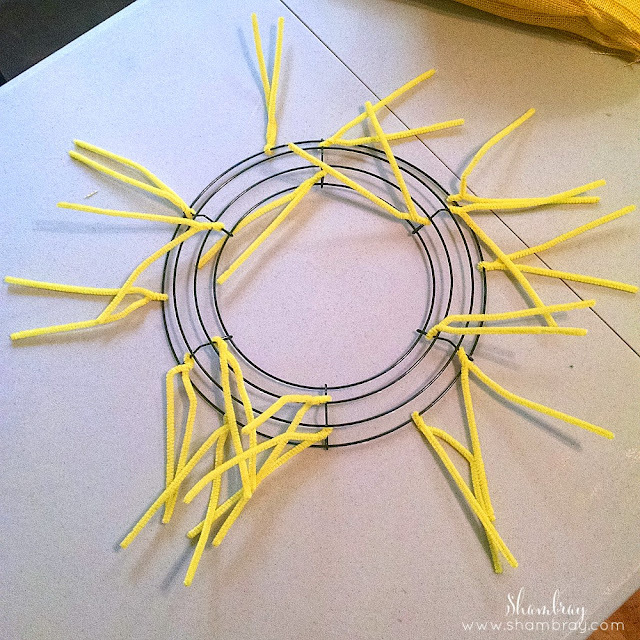 You will need to wrap the chenille stems around the outside circle and the inner most circle. You will need 12 stems on the outside circle and 6 chenille stems attached to the inside. Also, do a cross bar in the middle part of the wreath. (Not pictured on this picture. It will look like a plus sign). 2. Cut the squares of yellow burlap. The squares need to be 10 x 10 inches. You will need about 36 squares. 3. 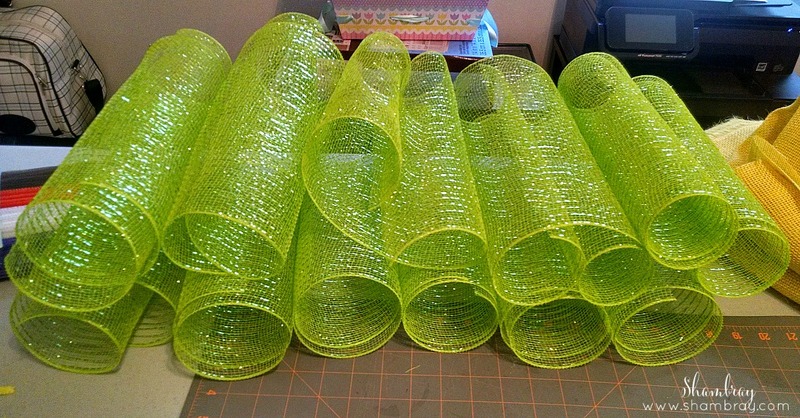 Cut the deco mesh into 15-16 inch pieces. It doesn't have to be exact. 4. 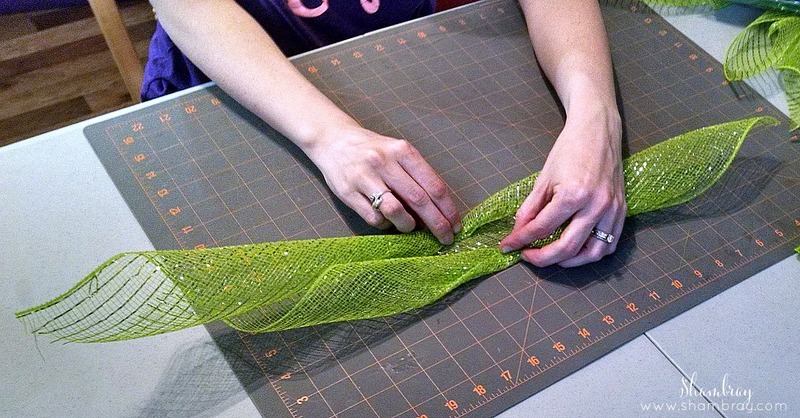 Pull the deco mesh diagonally (length wise) and then roll the top and the bottom in towards the middle. Again this doesn't have to be exact. I love this! So great for summer and for the house. I'm not the greatest when it comes to crafts, but this doesn't look to hard. I bet I could try it out! This wreath is GORGEOUS! And it's just perfect for summer. Thanks so much for the great step-by-step too. I'm definitely sharing this one! You should! It is so fun. I am sure you would do a great job! Thank you so much for the kind words and for sharing! I'm a little late getting my comments out! I featured your sweet wreath today on the blog and social media! Thanks so much for pinning to the P3Party Board! Happy Weekend! This is beautiful! Where did you find your yellow burlap ribbon? That is the only thing I am having trouble finding. I actually didn't buy ribbon. 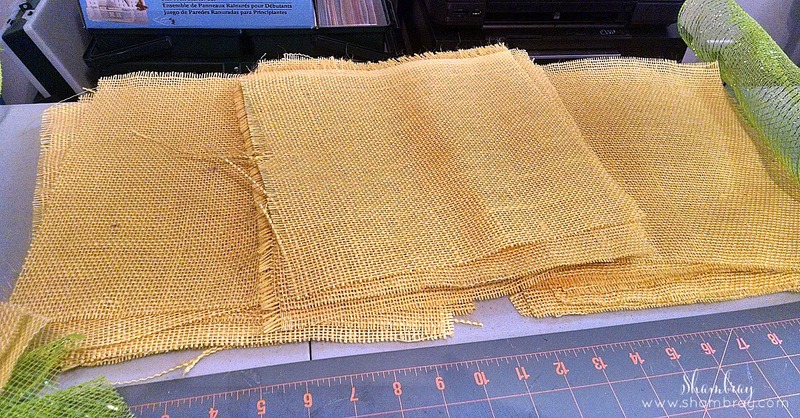 I bought yellow burlap by the yard. 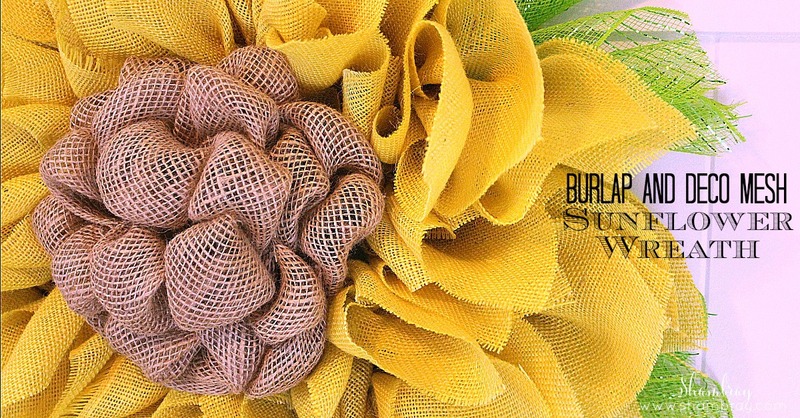 If you click on "yellow burlap" on the supplies list above it will take you to the link that I bought it from. I have made this a few times and one of the times I purchased the yellow burlap from Hobby Lobby as well. I just finished my giant sunflower wreath and have to say, "thank you for the amazing design idea and for the comprehensive tutorial." This sunflower is going to look so good on my front door. This comment makes me so happy! I am so glad that you were able to make it and can now enjoy it! What size is the yellow burlap?? I bought 3 yards of it and had a little extra. That way if I had made any mistakes in the cutting I had a little to spare. Hello. I have the 12 in deco mesh and I know I need 15-16 piece but how long do I cut the mesh? Thank you! What you will do is take the 12 inch roll and cut 12 pieces at 15-16 inches. Then once you get to step 11 you will see that I said to cut the deco mesh to where it is barely showing from behind the yellow petals. I just eyeball it. You want the green barely longer than the yellow. You can see a good close up in the second picture on step 12. Let me know if that doesn't make sense. Hey there! I know this was posted last year but just found it and am making it too. I didn['t know which sized of the green mesh to get so I got the bigger width. Looking at the pics it looks like yours was smaller. Can you give me an approx. of the length and width. I was just guessing 12 x 12 since they have to be longer than the yellow burlap. Thanks for the ideas! thank you so much for sharing! I was working on a flower today and got stuck when it came to doing the center...tried satin ribbon...looked awful! Now with this sweet bubble center my flower is going to look sooo pretty!Thanks so much again!Can't wait to finish it now and hear all the oohs and awes! Thank you for sharing your design! I made one and gave it to my Mom for Mother's day yesterday. Now my sisters and friends want one. Only problem I had was cutting the smoothfoam ball in half. Any tips on how to do this easily and safely? Thank you! It is a 12 inch roll cut in 15-16 inch pieces. I'm so happy you found something to help you finish it. Enjoy! I'm so sorry that I'm getting back so late. I have been sick for over a month..not fun! I have found that using a Sawzall is easiest, but I've been without blades for that and a bread knife works pretty easy. Just go slowly until you get the blade down in the ball. Craft stores also sell half balls, but they are more pricey. I am so glad you like it! Enjoy! Kim. Yes I would do 15 inch pieces, but again it won't be exact. You will trim them at the end to the desired length anyways. Hey! It cost me about $22, but I had some left over supplies. For sure you will have more of the green deco mesh. You will have half of the Styrofoam ball. You will have a little bit of yellow burlap left. I had a TON of the chenille stems left. Then you will also have some greening pins left and the natural burlap too. It is hard to say exactly, but I would say maybe $10-$15 per wreath. If you have more questions feel free to email me at support@shambray.com. Absolutely beautiful! Thank you for sharing your instructions. One question..
where do you get your yellow burlap and fabric at? I can't wait to start! Christine, I have bought it at Hobby Lobby and on Amazon. There is a link in the supply list that you can click and it will take you straight to the Amazon product.